Watch this quick demonstration video and see hexagon-shaped cement tiles made. Watch this demonstration video and learn how to grout cement tiles. You may use colored or white grout. If you decide to use colored grout we recommend that it be a color that is the same, or lighter than the lightest color used in the pattern. The grout should be fluid enough to completely fill the joints. Apply the grout with a rubber float or with a rubber squeegee, always moving diagonally across the joints. Any excess grout should be removed with a damp cloth or sponge before it dries. If tiles are installed before construction is finished make sure you protect them appropriately by covering them with a large piece of cloth, fabric or a tarp. The color layer is prepared using a mixture of marble powder, white cement and other minerals including pigments. The color mixture is hand poured into the molds. Solid color cement tiles only have an outer "picture frame" mold that provides the shape for the tile body which is usually square but can be rectangular or hexagonal. Patterned cement tiles have an additional mold that fits inside the outer frame. Different colors are poured into each segment of the mold to form the pattern. The patterned mold is removed. A layer of cement is sprinkled on top, thus providing a bond between the color layer and the body of the tile. A layer of cement and sand then creates the tile body. The tile is hydraulically pressed into shape to increase density. This is why the tiles are sometimes called hydraulic tiles. The tile is turned out cured underwater to create extra hardness. After air drying for a few weeks, the tiles is complete. Check out our videos and watch patterned cement tile and solid color cement tile being made. 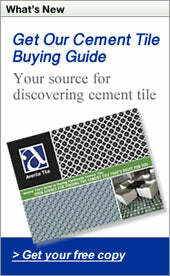 To find out more about cement tile, call us toll free at 888.739.4972, 9 AM - 5 PM PST, Monday through Friday. Or, by e-mail: info@aventellc.com.